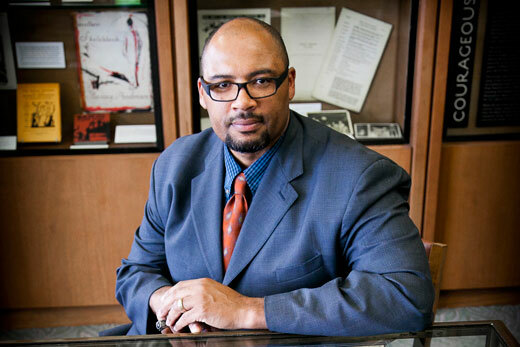 Pellom McDaniels, faculty curator of the African American collections in the Manuscript, Archives and Rare Book Library (MARBL). Emory Photo/Video. Pellom McDaniels III has been a professional football player, an inventor, an artist, an author and a professor. He's still many of these, but his chief title at Emory is faculty curator of the African American collections in the Manuscript, Archives and Rare Book Library (MARBL), where he has been on staff since July. He brings a new focus to MARBL, on African Americans and sports. McDaniels is spearheading MARBL's plans for the Robert Langmuir Collection of more than 12,000 photographs depicting African American life from the early 19th century to the mid-20th century. This spring, he's teaching a course based on the Langmuir collection entitled "Looking at the Familiar: History, Memory, Race and Photography." He wants undergraduates to develop an early interest in the archives and learn interdisciplinary methods of analysis. "I want my students to have a fire in their bellies to do research. My approach to teaching in the archives seeks to challenge students to reimagine the use of primary evidence as the basis for their research, which will result in public scholarship projects like exhibitions, websites and podcasts," he explains. Have you always been interested in sports? My initial interest in sports came from being a kid who liked football. So I played football, I wrestled, and I was a discus thrower in high school and in college until Oregon State eliminated track and field from the sports program. But only within the last 10 to 15 years have I come to appreciate baseball. My grandfather wanted me to play baseball, but I just wasn’t interested. Like so many men of my generation, "Monday Night Football" attracted us to the sport. Growing up in the San Francisco Bay Area, we had two NFL teams to choose from—the San Francisco 49ers and the Oakland Raiders. I became a fan of defensive lineman Lyle Alzado, who I thought was the most fearsome player in the NFL. He wore #77 for the then-Los Angeles Raiders, and throughout my high school, college and professional career, I wore the same number. You started your professional football career as a defensive lineman in the NFL-sponsored World League of American Football in Birmingham, Ala. How did you progress to the Atlanta Falcons? My first experience in professional football was with the Birmingham Fire in 1991. At the end of the season, I was asked to come to the Philadelphia Eagles training camp among others. Being somewhat naïve, I went to Philadelphia because Reggie White was there, and I thought the world of him as a player and as a man. I didn't make that team. So, I went back to Portland, Ore. and coached high school football for a year, and waited for the second season of the World League to begin. After the 1992 season with the Birmingham Fire, I was invited to the Kansas City Chiefs training camp. Initially, I made the team roster, then I was placed on developmental, and then I was out of a job again. However, I was offered a contract in 1993, which included an invitation to participate in the off-season workout program. I stayed with the team for six years and was part of the great defense we had throughout the 90s. In 1999, I became a free agent and chose to come to Atlanta to play for the Falcons. Unfortunately, early in the 2000 season my career came to an abrupt halt when I was diagnosed with blood clots in my lungs, the result of deeply bruised ribs and a long flight from Japan, where we played against the Dallas Cowboys in the Tokyo Bowl. How did you decide to come to Emory? When I decided to retire from the NFL, I already had a business selling my dental product, Dr. Brizzly. But I realized that I was limiting my opportunities to pursue anything intellectual. I would be so far into my company and its daily requirements that it was going to be difficult to step off of the path I was on. I also had the option of going into broadcasting, which I had cultivated in Kansas City, where I hosted a cable talk show and was a color commentator for Friday night football. However, I still had questions related to why black males pursued sports to the ends that we have assumed to be common among the group. How did you formulate the plans for the Robert Langmuir collection — the digitization, traveling exhibitions and teaching faculty to utilize it? I offered a new course to help students develop skills in research and analysis through applied history. Essentially, one of my primary objectives was to introduce students to the rigors and beauty of research, which ties into Emory's Quality Enhancement Plan [which has adopted the theme Primary Evidence, using original sources in research]. From my experience, introducing students to the archives early in their freshman and sophomore years not only provides them with practical learning opportunities and skills development, but also provides a foundation for their development as critical thinkers. Faculty can also become invigorated by having this kind of youthful student interaction. I started out as a fine arts major in college, but changed majors when I learned my scholarship didn’t pay for art supplies. However, I still paint. I still create. But, I have a hard time selling my work. Someone once told me you have to sell your work because your wife's not going to like having all this stuff around the house. Another wise individual remarked that some of these things [ideas developed through the works you create] you have to let go because if you keep them next to you, you never grow beyond that. I do have one painting of Joe Louis—whom I depict as a saint— that I created a few years ago that [senior faculty curator at MARBL and professor emeritus] Dana White and I are going to put to good use in a project about the former heavyweight boxing champion's life and career. I've also finished an unpublished 50-page paper on [Georgia native and American artist] Benny Andrews. I think it's going to be the basis for a book I've already talked to a publisher about. It deals with his life as an artist, activist and art critic. What are your ultimate goals for MARBL? My hope for MARBL is that we become more intentional in our efforts at developing tools that allow researchers, scholars, students and people from the community to gain access to our rich collections. The QEP presents an opportunity to create relationships with departments across campus, which will attract more students to MARBL and reestablish our importance to the future of the university. Our new collections [that] focus on African Americans and sports I hope will elevate the conversation around who, what, when and why African Americans pursued and used athletics as a form of resistance to notions of black inferiority. Unlike other institutions, MARBL is open to the public. We're even open on Saturdays. More than anything, I would like students to know they are more than welcome to come up to the 10th floor of the Woodruff Library to see the wonderful world of primary evidence.